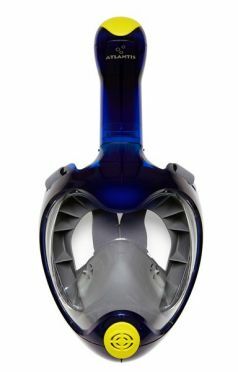 The Atlantis TriTon Full face snorkel mask blue is the more luxurious version of the Atlantis mask and is made to last longer. The unique design is based on the original Atlanits mask and gives the TriTon a super sleek look. The TriTon has an extra soft silicon face-seal that allows you to keep on snorkeling for a longer time without getting bothered by the mask. In addition, it is also extra shock resistant and more colourfast. The large lens of the TriTon provides a crystal clear 180 degree field of view. The TriTon comes with a GoPro mount which can be attached to the mask. 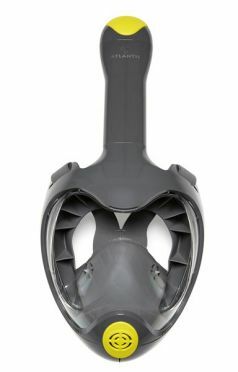 The Atlantis TriTon Full face snorkel mask grey is the more luxurious version of the Atlantis mask and is made to last longer. The unique design is based on the original Atlanits mask and gives the TriTon a super sleek look. The TriTon has an extra soft silicon face-seal that allows you to keep on snorkeling for a longer time without getting bothered by the mask. In addition, it is also extra shock resistant and more colourfast. The large lens of the TriTon provides a crystal clear 180 degree field of view. 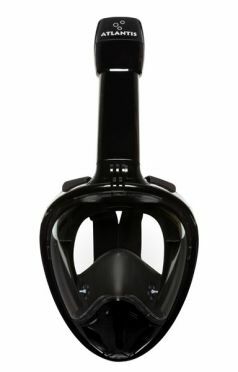 The TriTon comes with a GoPro mount which can be attached to the mask. The Atlantis TriTon Full face snorkel mask black is the more luxurious version of the Atlantis mask and is made to last longer. The unique design is based on the original Atlanits mask and gives the TriTon a super sleek look. The TriTon has an extra soft silicon face-seal that allows you to keep on snorkeling for a longer time without getting bothered by the mask. In addition, it is also extra shock resistant and more colourfast. The large lens of the TriTon provides a crystal clear 180 degree field of view. 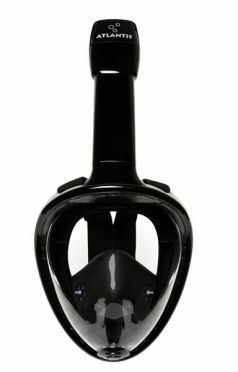 The TriTon comes with a GoPro mount which can be attached to the mask. 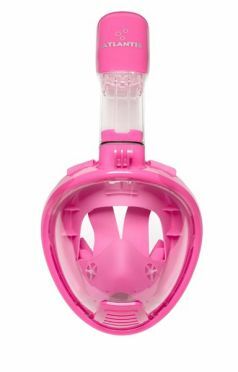 The Atlantis 2.0 Kids Full face snorkel mask pink has the same advantages as the adult model but in a child's size. This mask allows you to breathe through your mouth and nose just as easily as above water, this is especially for children a more pleasant way of snorkeling. The round lens (spherical) of the mask gives you a 180 degrees field of view without the break lines that you see with flat lenses. On top of the mask is a GoPro holder mounted with which you can capture your adventures underwater and share them with other people. This mask is made for children of age 6 or above. 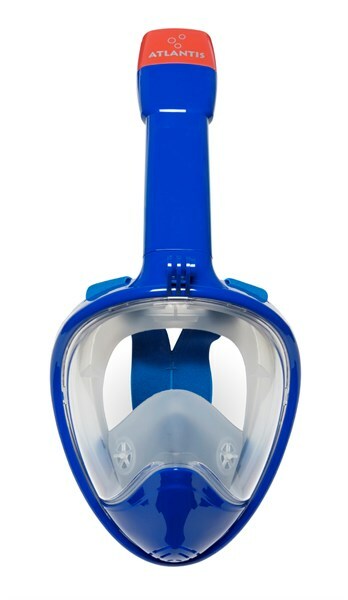 The Atlantis 2.0 Kids Full face snorkel mask blue has the same advantages as the adult model but in a child's size. This mask allows you to breathe through your mouth and nose just as easily as above water, this is especially for children a more pleasant way of snorkeling. The round lens (spherical) of the mask gives you a 180 degrees field of view without the break lines that you see with flat lenses. On top of the mask is a GoPro holder mounted with which you can capture your adventures underwater and share them with other people. This mask is made for children of age 6 or above. The Atlantis 2.0 Full face snorkel mask black/red has received a totally new design and makes Snorkeling more fun than ever. The lens of the mask is now completely round (spherical), so it still has the 180 degrees field of view, but without breaking lines that masks with flat lenses have. Because of this you almost forget that you're diving with a mask on. Also new is the fixed GoPro holder that is mounted on top of the mask. The renewed valve system ensures easier breathing. The Atlantis 2.0 Full face snorkel mask white/blue has received a totally new design and makes Snorkeling more fun than ever. The lens of the mask is now completely round (spherical), so it still has the 180 degrees field of view, but without breaking lines that masks with flat lenses have. Because of this you almost forget that you're diving with a mask on. Also new is the fixed GoPro holder that is mounted on top of the mask. The renewed valve system ensures easier breathing. 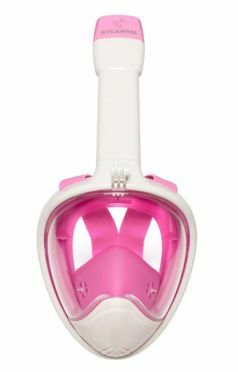 The Atlantis 2.0 Full face snorkel mask white/pink has received a totally new design and makes Snorkeling more fun than ever. The lens of the mask is now completely round (spherical), so it still has the 180 degrees field of view, but without breaking lines that masks with flat lenses have. Because of this you almost forget that you're diving with a mask on. Also new is the fixed GoPro holder that is mounted on top of the mask. The renewed valve system ensures easier breathing. 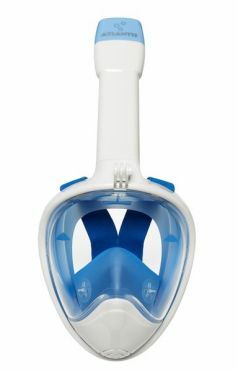 The Atlantis 2.0 Full face snorkel mask blue has received a totally new design and makes Snorkeling more fun than ever. The lens of the mask is now completely round (spherical), so it still has the 180 degrees field of view, but without breaking lines that masks with flat lenses have. Because of this you almost forget that you're diving with a mask on. Also new is the fixed GoPro holder that is mounted on top of the mask. 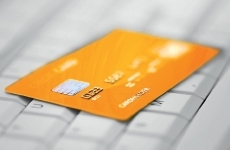 The renewed valve system ensures easier breathing. 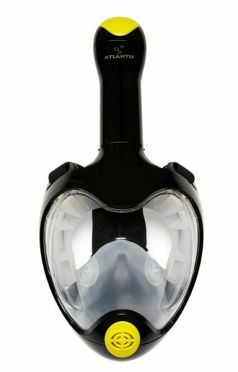 The Atlantis 2.0 Full face snorkel mask black has received a totally new design and makes Snorkeling more fun than ever. The lens of the mask is now completely round (spherical), so it still has the 180 degrees field of view, but without breaking lines that masks with flat lenses have. Because of this you almost forget that you're diving with a mask on. Also new is the fixed GoPro holder that is mounted on top of the mask. The renewed valve system ensures easier breathing. 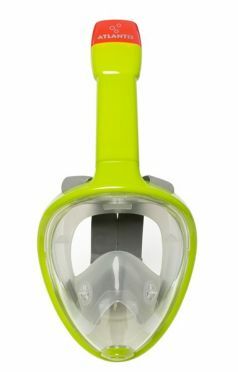 The Atlantis Full face snorkel mask green is designed so that breathing under water is as easy as it is above water, through both your nose and your mouth. The large lens of the Atlantis provides a crystal clear 180 degree field of view. Thanks to the new longer snorkel tube, the top of your snorkel is higher above the water surface. 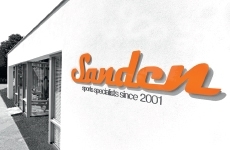 The Dry-Top technology ensures that almost no water will get in the mask. But ff some water flows in, it will be drained by the valves at the bottom of the mask. 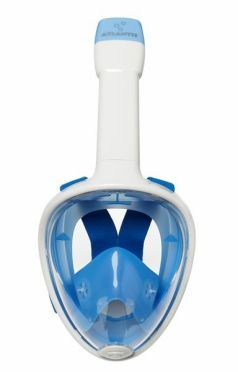 The Atlantis Full face snorkel mask white/blue is designed so that breathing under water is as easy as it is above water, through both your nose and your mouth. The large lens of the Atlantis provides a crystal clear 180 degree field of view. Thanks to the new longer snorkel tube, the top of your snorkel is higher above the water surface. 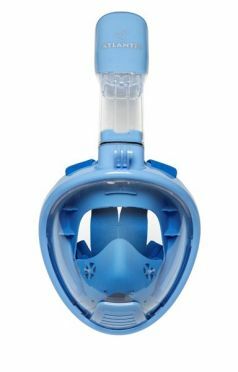 The Dry-Top technology ensures that almost no water will get in the mask. But ff some water flows in, it will be drained by the valves at the bottom of the mask. 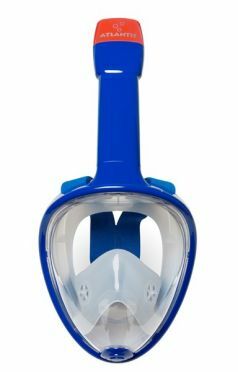 The Atlantis Full face snorkel mask blue is designed so that breathing under water is as easy as it is above water, through both your nose and your mouth. The large lens of the Atlantis provides a crystal clear 180 degree field of view. Thanks to the new longer snorkel tube, the top of your snorkel is higher above the water surface. The Dry-Top technology ensures that almost no water will get in the mask. But ff some water flows in, it will be drained by the valves at the bottom of the mask. The Atlantis Full face snorkel mask black is designed so that breathing under water is as easy as it is above water, through both your nose and your mouth. The large lens of the Atlantis provides a crystal clear 180 degree field of view. Thanks to the new longer snorkel tube, the top of your snorkel is higher above the water surface. The Dry-Top technology ensures that almost no water will get in the mask. But ff some water flows in, it will be drained by the valves at the bottom of the mask.